Pictured below are a couple of the sheath styles I make for the Rambo "First Blood" and Rambo "Mission" knives. They are as close as possible to the original sheaths used in the movies. The sheath sold with the U.C. Rambo I knife is nothing like the actual sheath used in the filming. No stone is included with the sheath but the stone pocket is formed to take a 4" x 1" x 1/2" stone, which is the size used in the original. If you need a different size pocket let me know. 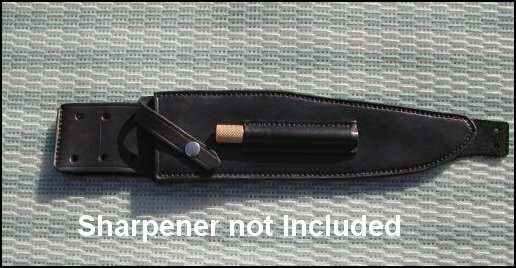 The Rambo II knife used an EZE-Lap Diamond sharpener, which is not included but they can be found on the net. Ask if you need a link.